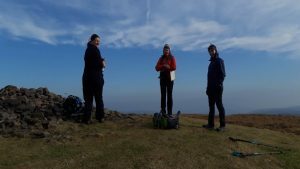 Brecons 2019 – hiking in the spring sunshine! 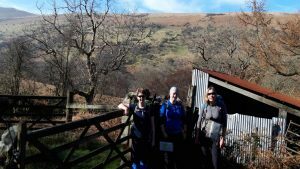 A group of four lucky people made up of Jules, Sarah, Cara and Gemma chose the sunniest and warmest weather in mid-February for a wonderful weekend away in the Brecon Beacons in South Wales. Leaving London at 4.30pm on the Friday afternoon meant that they were well ahead of the traffic until a long queue developed on the M4 before the Severn Bridge. Feeling in need of something to eat – and not fancying sitting in a traffic jam – they took a lengthy detour (thanks Google) to Littleton-upon-Severn. Here they had a delicious dinner at the White Hart, where the venison sausages are highly recommended! 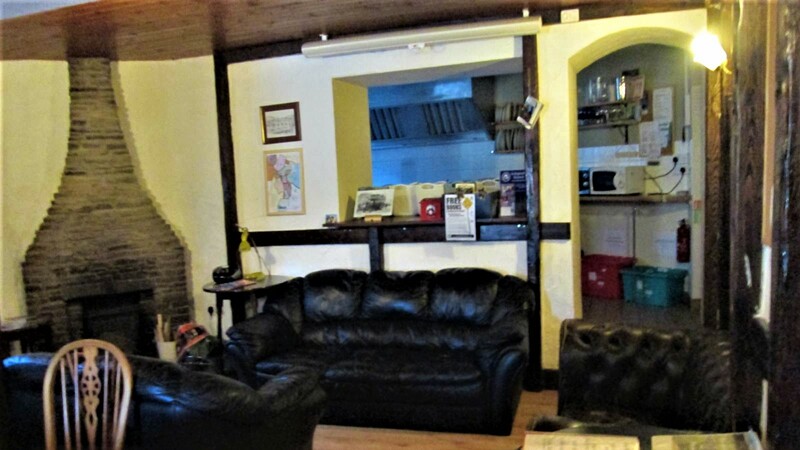 And this worked perfectly as it was only a 30 minute drive to the Star Bunkhouse in Bwlch. The Star Bunkhouse was easy to find and conveniently located between both the Brecons and Black Mountains. On arrival, they were welcomed by Emma and her two gorgeous Labrador dogs and given a very detailed tour of the accommodation – it was extremely comfortable, well equipped and strikingly clean. Definitely a cut above our usual accommodation! It’s also just a stone’s throw away from the New Inn pub across the road – and it was still open! – so a quick sampling of the locally distilled gin and vodka and cider brew was had by all before heading off to bed. 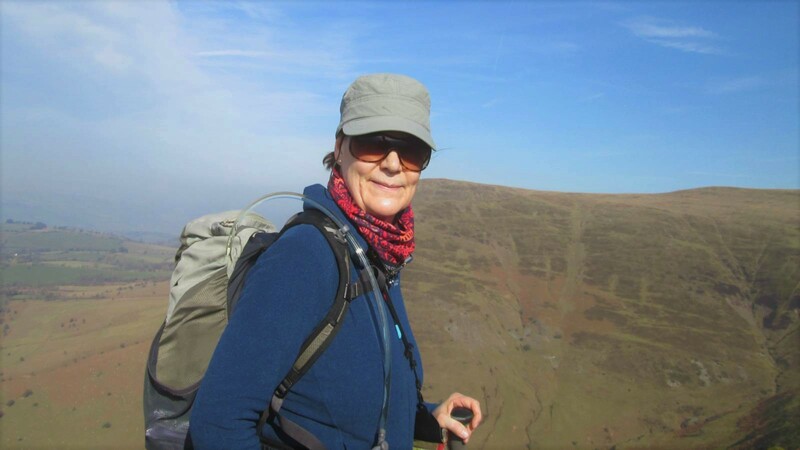 On Saturday morning the intrepid four were woken by glorious sunshine, beaming in through the window, and headed off to the Grwyne Fechan valley in the Black Mountains for a 19km circular walk. 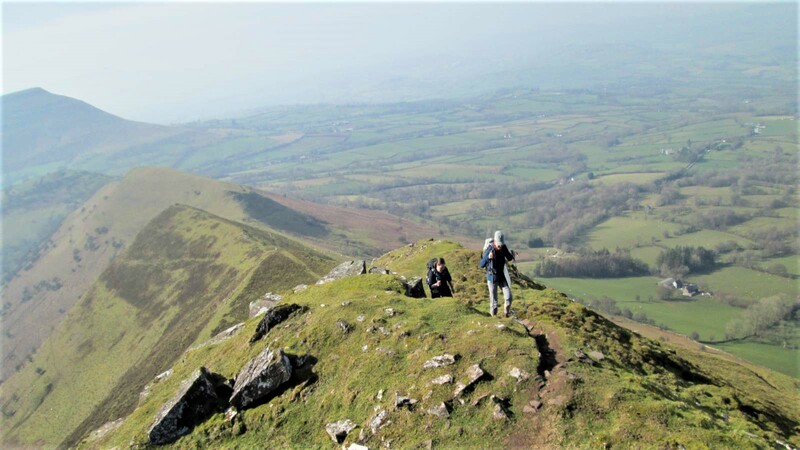 It was like a spring day as they headed up the windy ridge towards Waun Fach (810m) and all had just T-shirts on enjoying the warmth. It was an easy route to follow on the map and much fun was also had in discovering the joys of pinpointing their exact location through the OS mobile download! Enjoying perfect visibility, they picnicked on the summit with fantastic views across the mountains, with a small herd of Welsh Mountain ponies below. 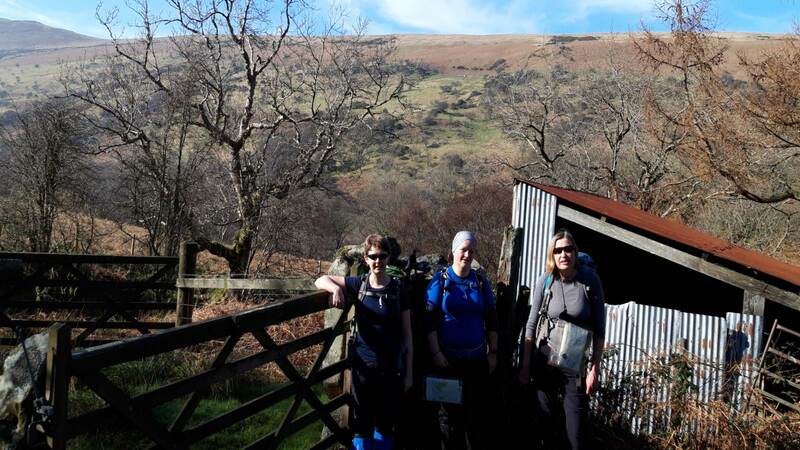 They then headed to Pen y Gadair Fawr (800m) and then back down the valley again to where they’d started the route. Luckily, the results of the Wales/England rugby match were in Wales’ favour so the bartenders in the New Inn were in a very jovial mood when the group arrived for supper. They all enjoyed yet another delicious meal, washed down with more local brew, in very pleasant company and surroundings. On Sunday a group decision was made to do a shorter route from Llanfrynach of just 10.6km up the Cwm Oergwm valley along the river to the waterfall and back, in order to be in time for tea at Crickhowell. It was yet another glorious day and they had a great time taking in the beautiful scenery followed by a long picnic in the sun, dipping their toes in the cool water by the waterfall. Unfortunately, with all the leisurely picnicking they didn’t make it in time for the teashop in Crickhowell, so instead opted for the nearest pub – the next best option for tea and cake before heading home. Thanks to Jules for the great report! All in all, it was a great escape for the weekend. Big thanks to Sarah for doing all the driving and to everyone for being such great and fun company – sorry others weren’t able to come along too. Fancy coming along to a meet? Check where the MMC is going next here.